Coaching peewee football is an immensely rewarding experience. Affecting the lives of youngsters, watching them grow and develop, and become an intricate part of their lives is one of the most satisfying experience a parent, or head coach can have. In order to insure that the experience is equally as rewarding for the kids, you have to level the playing field. If the kids feel worthless or feel that they are playing out of position, then you are only hurting them and the future of football. Football is an exciting sport, and we need to work hard to make sure that future generations will love the sport as much as we do. We all know the kid that was a little heavier than the rest of the kids and was put on the offensive line and told that he is a lineman. A few weeks later, the kid quits and his organized football career is over. It’s hard to tell at age 9 where a kid belongs, and you don’t want to turn anyone away from the game of football. In order to alleviate this problem, you should allow all the kids to play all the positions. This will eliminate all hard feelings, and all the prejudice as to who plays what position. Further, at age 9, it’s hard to tell how big, tall, skinny, strong a kid will grow up to be. Trying to fit a 9 year old into a mold and limit their skill set from such an early age is very detrimental to the kid’s development and career. The best solution for this is to have all the kids, no matter how tall, skinny, fat, or strong practice all the skills and all the drills, even the kicking drills. Every football player should know how to properly throw a ball, properly punt, properly kick as well as catch, block, and run. We’ve all seen Ladanian Tomlinson rush for touchdowns. We’ve seen him catch plenty of touchdown passes. And we’ve even seen him throw touchdown passes. In fact, in 2005, he did all three in a single game. On top of all of this, he blocks in pass protection, can play special teams, and if asked, can probably kick a field goal. That is what a true football player does; he plays football. As parents, coaches and mentors, it is our responsibility to make sure our kids can play football. We’ve all heard the old adage, “Just be a football player!” We have to embody that adage. That includes all facets of the game. Eventually, as your kid matures mentally and physically, it will be obvious what position he should be playing. But in peewee football, we should focus on developing all the basic skill sets. And that really means all the skill sets. From the very beginning, every kid should be involved in every drill. All the blocking drills, all the passing drills, all the coverage drills, all the tackling drills, all the running drills, all the kicking drills, everything. There is no reason to start classifying kids into positions when they are barely out of grade school. We need to raise future football players. Not incomplete, inadequate, and useless specialists. The difference between making a team on college level and in the NFL can be how many skills you bring to the table. We’ve all seen the wide receiver in the NFL that barely makes the team, but is chosen over another wide receiver because he can return punts or has phenomenal special teams abilities. We need to teach our kids to be complete players. That’s why a guy like Antwan Randle El gets a $30 million dollar contract to be a wide receiver for the Washington Redskins. Not because he is a great wide receiver, the guy has only 7 touchdowns in 8 years of play. But because, he can pass, return kicks, he can run, and brings a lot of football skill to the table. This also means that every kid should get the chance to play every position. Peewee football is for fun and development. The goal is to develop future athletes that are nimble and have a complete skill set. If they don’t actually play all the different positions, then you haven’t accomplished anything. Make sure every kid gets to play every position. 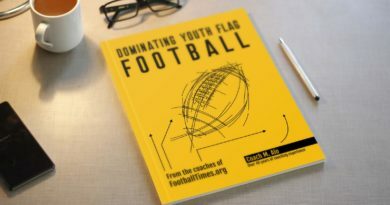 This is probably the best way to teach football to the future generations that will be enjoying the most popular sport in America for generations to come.